If you haven’t seen last nights series two finale of Sherlock, with Benedict Cumberbatch and Martin Freeman, then read no further. If you have, my guess is that you will dig deep into the following interview with co-creator/co-writer, Steven Moffat, and then watch your DVR recording several more times with a bit more of a critical eye. If you did see the brilliant final scene, what really happened when Holmes plunged to his death? Or did he? Following the BBC broadcast of the final episode in the UK, Moffat teasingly told The Guardian‘s Stuart Jeffries, “There is a clue everybody’s missed. 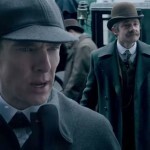 So many people theorising about Sherlock’s death online – and they missed it! 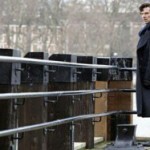 We’ve worked out how Sherlock survives, and actually shot part of what really happened. It all makes sense.” He went on to say that both he and co-creator Mark Gatiss wanted to baffle a nation by killing off Sherlock, putting his body apparently in plain view on a London pavement and then bringing him back from the dead. FYI, in case you’re wondering, they not only successfully baffled the UK, but now the States also. While the world’s greatest, and only, consulting detective will be back for a third series of three 90-minute episodes, viewers can only sit and wonder just how Steven Moffat and Mark Gatiss bring ‘Holmes back from the dead’. 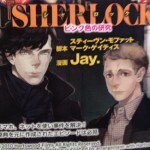 Unfortunately, they’ll have plenty of time given the third series will not begin filming until 2013, most likely. In the meantime, let us know what you think…. I think he actually threw the already dead Moriarty off the roof in his clothes, and his face was so bloodied, no one could doubt it was SH. On the other hand, seen even from upside down, the face looked more like JM. Just a thought. Last night was my third viewing, but I haven’t been able to figure it out just yet. I know by Sherlock’s adamant orders that it was important for John to not be close enough to see what was going to happen completely. And I assume the “help” he needed from Molly was her cooperation in identifying his body, if not helping him in faking the death altogether. But I don’t think I’ve caught the “clue” Moffat is talking about. I agree that Molly helped big time. I think it’s pretty obvious that whatever went down, something had to have happened when John was knocked over by the biker. Either way, I just finished it for the first time and I literally have a puddle of tears in front of me even though I knew Sherlock doesn’t die! i’m not losing any sleep over this. 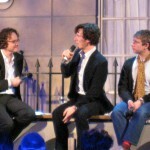 it could be something as trivial as sherlock doesn’t wear cufflinks. 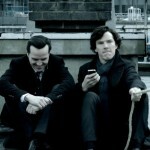 How does Sherlock compensate for the snipers seeing him NOT hit the pavement. It’s a big risk to cover every angle they might be looking from. angles and the church tower in the background at the scene on Barts rooftop. to keep safe the real home and family he finally has. little ball at ‘The Art and Logic of Sherlock’s Reichenbach Fall’ at sherlockreichenbachfallclue.tumblr.com.